We become extremely creative when we want to make an excuse. Our excuses can often sound very noble and even spiritual at times. We use excuses to fool others, but they are especially effective at helping us to fool ourselves. We use them as a sedative to soothe our conscience and to make us feel better about our own disobedience and laziness. 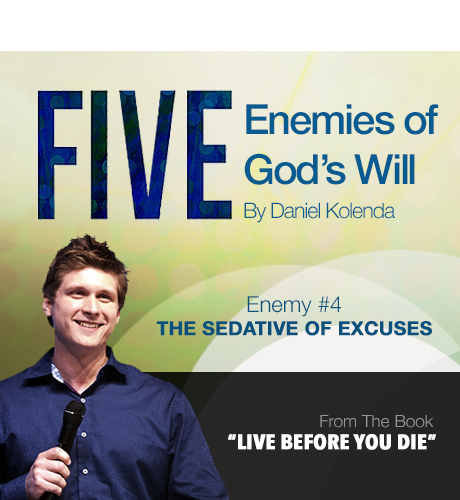 My friend, God has a wonderful plan for your life, and He invites you to partake of it, but excuses are a dangerous enemy that can keep you from possessing what God has for you. I have seen how excuses have kept so many wonderful people from realizing their God-given potential. This is a great tragedy because life is so short, and time wasted can never be recovered. This book has been written to help you discover God’s will for your life, but the discovery of God’s will for your life is never going to be enough in and of itself. Knowing God’s will and fulfilling it are two entirely different things! The reality is that many people already know what God has called them to do. Even if they don’t realize it or won’t admit it, God has already revealed His will to them in one way or another. But they never achieve all that God has given to them to accomplish. And they never enter into the fullness of the blessings God has prepared for them because they comfort themselves in disobedience and laziness through excuses. Although there are far too many excuses to mention, I would like to address a few that are especially common. As you read through the following list of excuses, I would like to challenge you to allow this to be a sort of diagnostic test. Examine your own heart to see if you are allowing these excuses or others like them, to keep you from walking in the fullness of what God has for your life.